‘Do not be troubled or weighed down with grief. Am I not here who am your Mother? Are you not under my shadow and protection? Am I not the fountain of life? Are you not in the folds of my mantle? In the year 2000, many of us lived through those anxious 35 days when the election had been thrown into the courts. I know that many in the country were praying fervently that George Bush would win, that someone who was pro-life would once again hold the Presidency. During those anxious days, I approached my pastor (now retired) and mentioned to him how upset I was about all of this. Out of the blue he said to me, “I’m not worried because I know Our Lady of Guadalupe will give George Bush the election.” At the time, I fluffed it off as a pious statement. Of course, I didn’t even ponder why my pastor, not a particularly political man and definitely not one given to pious pronouncements would be saying something so completely out of character (for him). Fast forward to the day the Supreme Court handed down the decision that decided the election (essentially stopping the endless recounts). I had promised Our Lady of Guadalupe that I would celebrate her feast day and pray for the election by attending the special Mass at my Church on December 12. As I was about to leave for this evening Mass, the news came out that the Supreme Court had rendered a decision. The initial reaction of the Fox News commentator that Al Gore had won was all I heard as I left for Mass. I was weeping throughout the Mass (a little embarrassing) and trying to offer this up to Our Lord for our country. To my incredible surprise when I arrived home, my husband met me at the door telling me that George Bush had won. My tears of sorrow were turned to joy. And for those in the pro-life movement George Bush has been a good President. A few years later, I heard something that again surprised me: that Jeb Bush who met his wife, Columba, while teaching English in Leon, Guanajato, Mexico in 1971 (Columba was born in Leon) made a pilgrimage with her to the Shrine of Our Lady of Guadalupe during the election crisis. 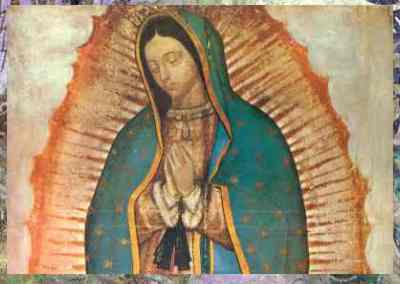 Our Lady of Guadalupe is the patroness of North and South America and patroness of the unborn. Amazing when you realize that the election was decided for the unborn on Our Lady’s feast day, December 12. Here are three online sources that reference this pilgrimage by Jeb Bush and his wife. George W. Bush elected on December 12th, the Feast day of Our Lady of Guadalupe, the Patroness of the Americas and the unborn . . .
Of course, I haven’t been able to find absolute proof that Jeb Bush and his wife made this pilgrimage but two other incidents have made me think it might be true. The first was on the night of the election of 2004 as I watched the returns I noticed something that surprised me. 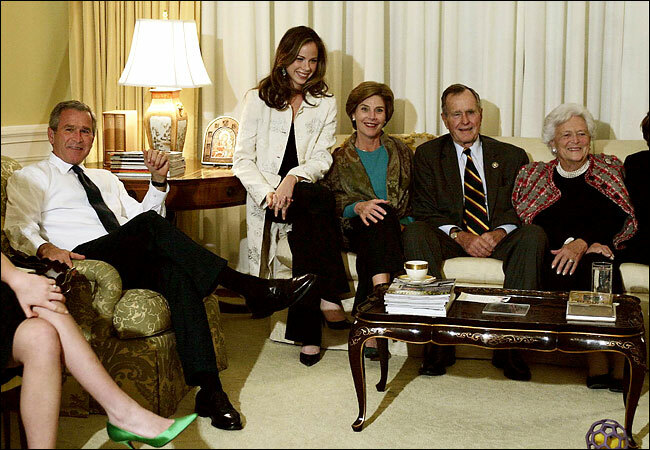 In the living room where George Bush and his family were watching the election returns was a small framed picture of our Lady. I went up close to the screen and pointed it out to my family. Since then I have found a photograph of this scene that I saw on television – see below. 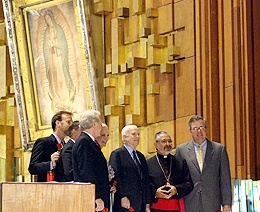 The other more recent event was on July 3 when John McCain and his wife visited and toured the Shrine of Our Lady of Guadalupe. Here is what happened. 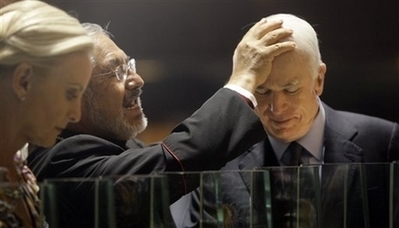 Guess who was with John McCain during this visit? Jeb Bush. While there Jeb Bush expressed confidence that the White House would stay in GOP hands. No wonder the battle is fierce! 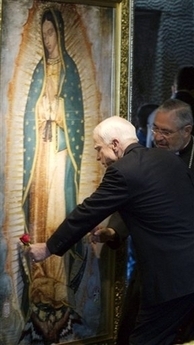 Our Lady leads; McCain will prevail for the unborn. I tell my mind to stop running in circles and my heart to be at peace. I believe in the power of prayer, and I believe in God the Father Almighty. Yet, I am fearful because there are many who don’t think things out, who don’t know that not only do we risk our unborn children, we risk the children we now have to the evils of ‘broad-mindedness’ and attempts to shake hands with the devil. Let us all pray for our country and the Christian ticket, John McCain and Sarah Palin. I think that there is a real chance that John McCain and Sarah Palin will win. Everyone has to get our there and vote. My reasons, first and foremost prayer. But also a unusually high number of people aren’t responding to the polls, there are a good number of undecideds in many polls,the polls are oversampling Democrats this year and I believe that there are a bunch of Hillary Democrats that are still mad and voting for John McCain. I have visited their blogs and they really understand better than most who Barak Obama is – it is very surprising to read them because while they agree with him on many issues they really think he is not a good man and refuse to vote for him.